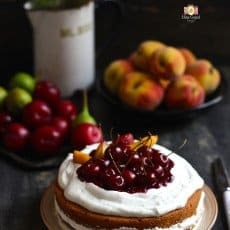 Eggless Sponge Fruit Cake Recipe is a simple vanilla flavored sponge cake mix transformed with a few decorative ingredients into a layered summer stone fruit cake. The fresh berry compote takes this humble cake recipe to another level of decadence. The other day while driving back to home from one of our backpacking expeditions, plenty of cheerful stone fruits by the roadside vendor caught my attention. And a thought shook me up, it’s almost September, the mid of the year. It seems the year is flying by at mad speed. The idea of shifting down to the countryside living could not slow down the pace of this year, though I assumed the otherwise. 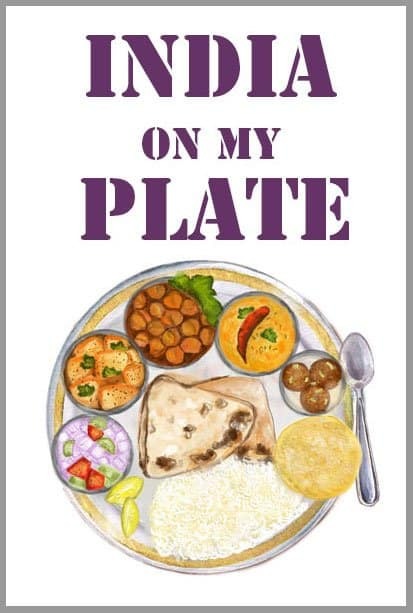 I am already seeing people bidding ode to summer, cribbing about monsoon and planning winter holidays. August – September is always a transitional month for me. 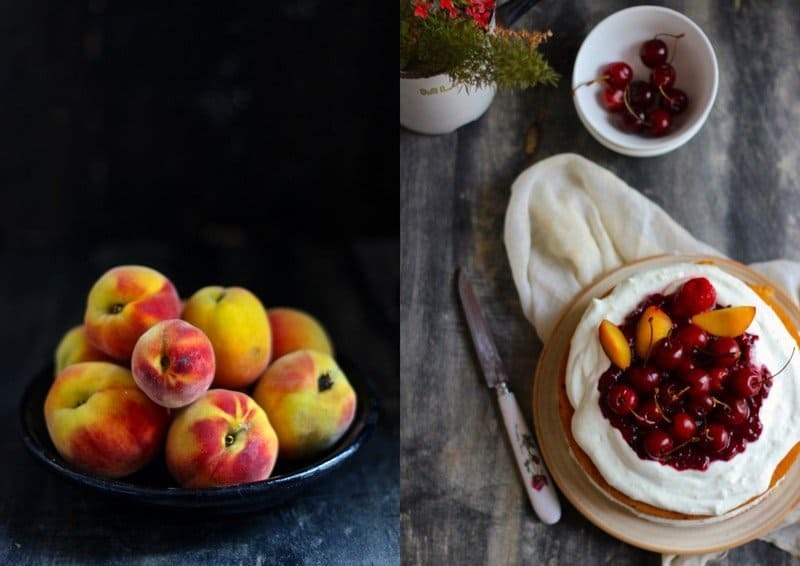 It’s not quite autumn, but it most definitely feels like summer is over, which mean you can spend some quality baking time in the kitchen without worrying about the melting butter and sweltering heat. Those who know me well, are aware that I am not the elaborately decorated cake kind of a baker. Though all those gorgeous cakes on Instagram or Pinterest look pretty darn stunning, like many other things I prefer the warmth of old fashion tea-time bakes over a fancy cream laced cake. Instead of towering cakes with beautiful piping details, I like to keep things a little more simple. 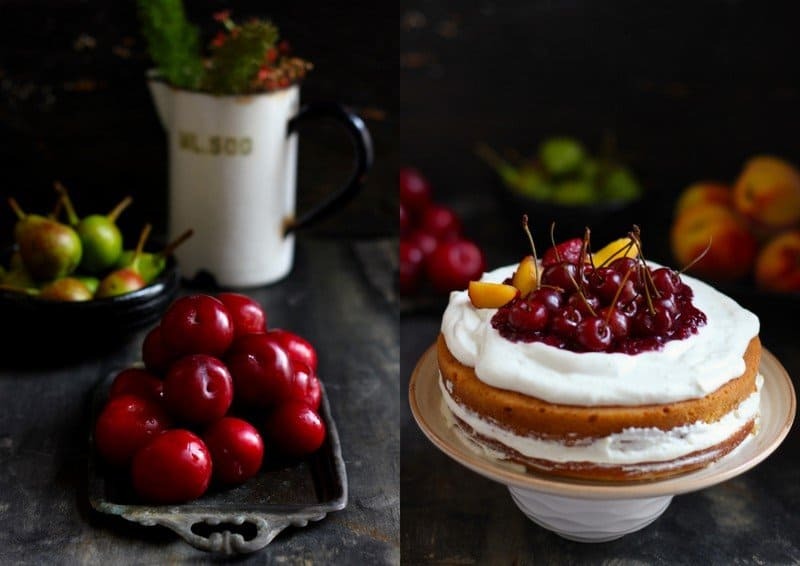 This time the charm of the gorgeous stone fruits hooked me into the idea of a layered cake. The deep red plumps, ruby pearls like cherries and the bright yellow peaches, all are inspiring enough to challenge one’s creative imagination. 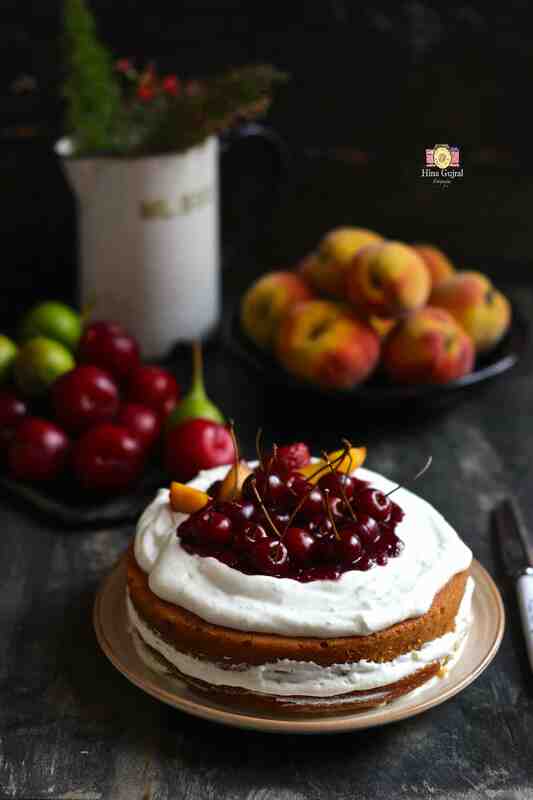 If you are not a fan of elaborate layered cakes, no worries – simply bake an eggless sponge cake following the recipe, serve it with fresh cream and sliced stone fruits, you can call it deconstructed stone fruit layered cake. All I know is you just can’t go wrong with a vanilla sponge cake, in all senses, it is simply delectable. 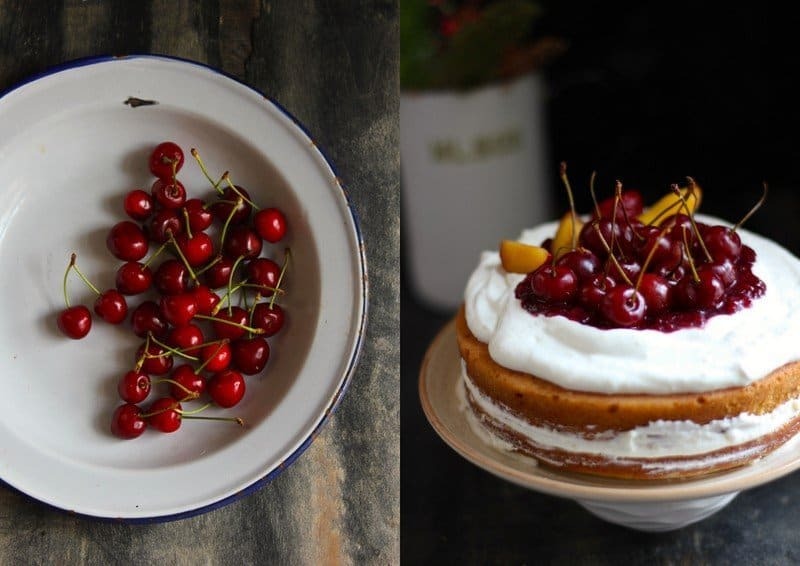 And however, after one delicious bite of the cake, I was totally convinced by the idea of sharing Eggless Sponge Fruit Cake Recipe on the blog. 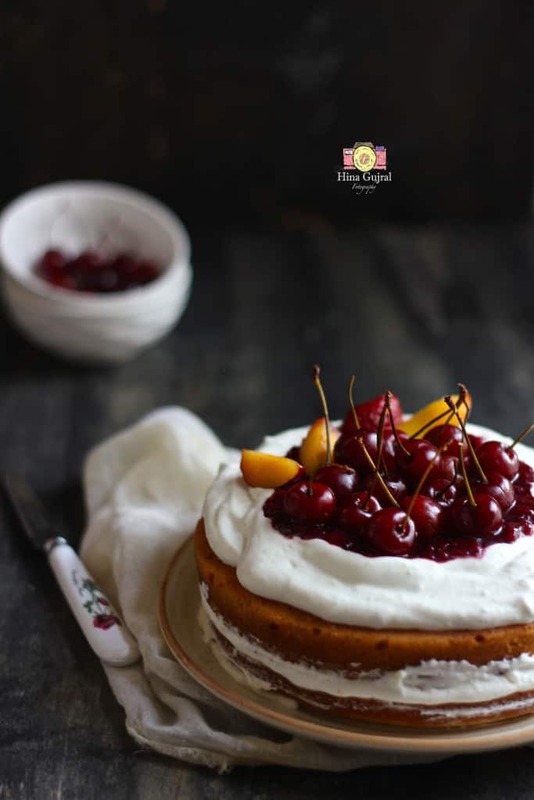 Eggless Sponge Fruit Cake Recipe is a simple vanilla flavored sponge cake mix transformed with a few decorative ingredients into a layered summer stone fruit cake. To prepare the eggless sponge, first sift together flour, baking soda, powder, salt together in a mixing bowl (buy it here). In another mixing bowl cream together butter and sugar using hand blender at medium speed still light and creamy in texture. Gradually add the condensed milk and whisk well using the hand blender till combined nicely. Now add the milk and vanilla essence, one last time whisk with the hand blender (buy it here) for 5 - 10 minutes at medium speed. Fold the sifted flour mixture in the liquid ingredients and gently combine to form a lump free batter. Make sure not to over mix the batter at the same time no streaks of flour should remain in the batter. Preheat your oven (buy it here) at 180 degree celsius. Grease a 8 inch round cake tin with little butter or line the base with parchment paper. Pour the batter in the prepared tin and bake for 30 - 35 minutes. After 30 minutes insert a toothpick in the centre to check for doneness. Remove the cake from the oven, after few minutes invert it onto a wire rack and let cool down completely at room temperature. Meanwhile, in a large clean and dry bowl, whip the heavy cream with icing sugar using hand blender till stiff peaks form. Keep the whipped cream in the fridge. To layer the sponge cake, cut the horizontally from the middle into two equal halves. In the bottom half add the generous amount of whipped and spread it with the back of the spoon. Over the layer of cream add one or two spoonful of strawberry compote and some sliced fruits. Cover this layer with the upper half of the cake like a sandwich. 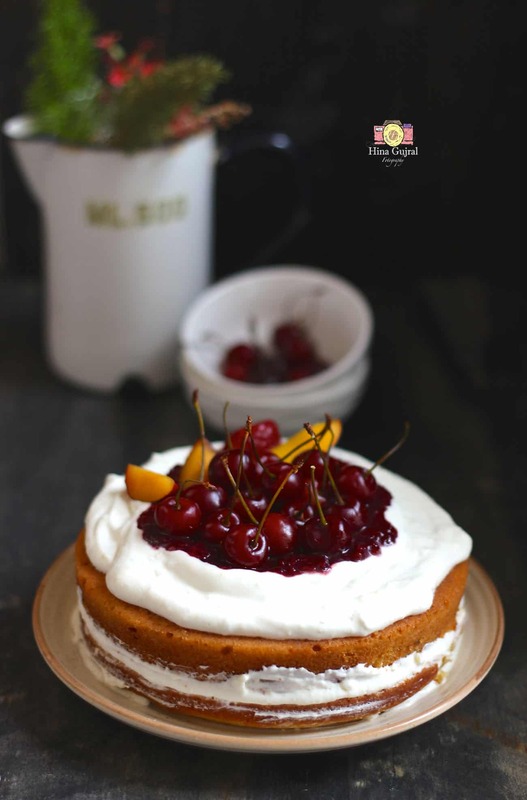 Layer the upper half as well with cream, cherry compote and sliced fruits. Keep the cake in the fridge for sometime before serving. I feel after getting chilled it tastes more delicious and the flavors are well soaked by the sponge cake.